Since the late 19th century the Heriz district of Azerbaijan in North West Persia has been one of the most popular and prolific carpet weaving areas, located about 40 miles east of Tabriz and comprising nearly 30 villages. The Heriz area has specialized in room size, semi geometric, brightly colored carpets primarily for export. The rugs have been marketed under several names and this has led to some confusion on the part of buyers. 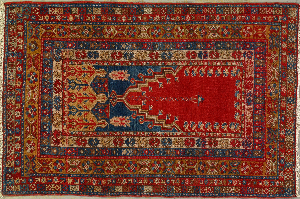 Any carpet from the region can rightly be called Heriz, but correctly it refers to pieces 9×12 to 12×20 in feet in stylized medallion and corner patterns, and in primary colors. The weave is medium to coarse, looser than Serapi grade and generally finer than the Gorevan type. 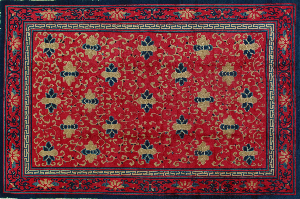 The tonality, primarily red, dark blue and ivory, is bright, crisper than many Bakshaish and Gorevan carpets. Overall patterns may be found, unlike the Serapi which is almost always in medallion formats. A few antique pieces have unique, custom designs. 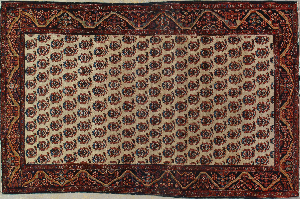 The Heriz carpet is essentially a 20th century creation. 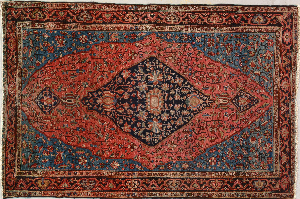 The “Serapi” is a term invented by American dealers to describe those Herizes of finer, closer weave quality with more spacious and flowing drawing than the more standard Heriz carpets. The pile is lower , and handle is firmer and more compact. These are a product of 1890-1920 era and were a aimed at the same clientele as the Ferahan-Sarouk. 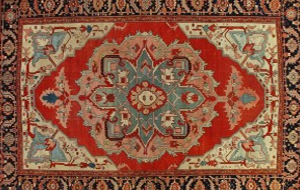 Unlike certain Bakshaish carpets, almost all are in medallion patterns. While certain Bakshaish medallion carpets are more angular in drawing, Serapis are more curvilinear. There is no Serapi village and the term is a quality grade only. 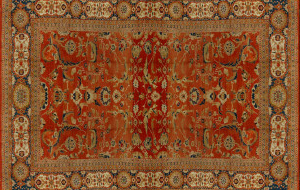 The Gorevan, popular from 1900 to the 1920’s, is a lower grade of Heriz carpet. There are more overall patterns, both traditional Persian and newly invented, more than in any other Heriz group. Fields are often in a desirable light blue. The pile is longer, shaggier and lies down more than in other Heriz area carpets. The weave is also looser and the rugs are quite pliable. Almost all are in 9×12 feet sizes and often squarish. After WWI medallion styles became even more popular and the distinctive Gorevan style was lost. Gorevan is an actual village, but the rugs were woven through the area. The Bakshaish carpet is, among other things, the ancestor to the, Gorevan . A distinguishing feature of many carpets is the presence of wool in the foundation. All other carpets from Heriz are strictly on all cotton ground weaves. There are two distinct types. First are the large squarish, overall pattern pieces with the unique use of plain camel tone outer borders. Fields are also often in camel or buff, and overall patterns of palmettes or Herati are encountered. The colors are more mellow then other Heriz area carpets and sizes run up to 15×20 feet. The other group is in brighter, red- light blue-ivory tones, and has very spacious medallion patterns. This type has more open field examples than in the other Heriz subgroups. The drawing is purely angular, unlike the Serapi type. 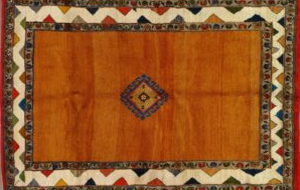 There are fewer squarish rugs in this subtype.it may be that this type of Bakshaish prefigures the Serapi, although both seem to have been woven at the same time. There was no Bakshaish village in 19th century, but it appears on 20 century rug maps. Production flourished from 1890to 1910, after which the styles were absorbed in to other Heriz types. Examples in top condition, overall patterns and softer colors are highly desirable and often fetch the highest prices of any Heriz area weaving. All these types are Turkish (symmetric) knotted. 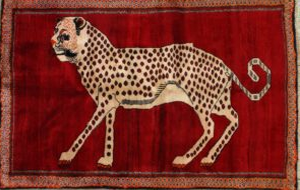 A few small scatter rugs, runners and long gallery carpets were woven in the area but the best work is generally in the larger pieces.